It’s the week for all things Independence Day, after our first look at the sequel promised a return to Earth for the aliens. But before all that, Titan Comics is releasing a new comic series that will link the two movies together—and io9 has an exclusive first look at some of the series’ gorgeous covers. As our world unites against invaders from beyond the stars, beneath the Atlantic Ocean, another mysterious craft prompts a top-secret investigation by the US military, one which could prove the key to humanity’s survival... or its ultimate destruction. With fear and suspicion running rife aboard the sub, Adams prepares to embark the alien vessel in search of answers. But how will its extraterresterial crew react to unwanted visitors onboard? But as well as that snippet of information, we also have a few of the wide range of variant covers being released for the comic making their debut here on io9. First up, two covers for Independence Day #1: A movie variant depicting the White House being destroyed during the first film, and a second by Dio Neves. 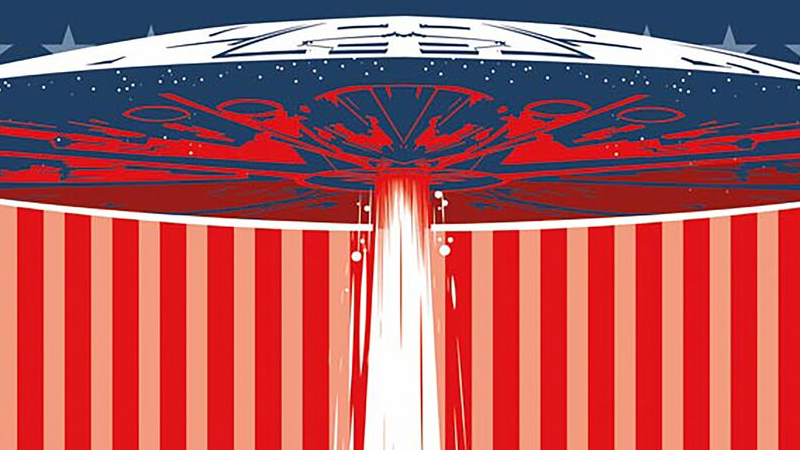 And two for Independence Day #2: A second movie variant, and a new cover by Alex Ronald.